There's nothing like getting over the flu than watching a grown woman spin yarn, round and round...round and round, which was what I did on Saturday at the FiberArts Knit and Crochet Fair at the Oakland Marriot. Thankfully I didn't get too dizzy, but I was just too bored to stay at home. I ventured out to the east bay hoping that the the sun and fresh air would do me some good. It was a nice awakening back to the real world (after being sick for 2 days), to see people plopped around on tables and chairs or in corners working on their knitting projects. 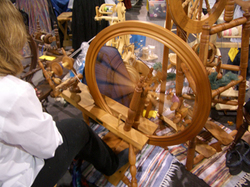 The highlight of course was the yarn spinning demonstrations. I swear I was mesmorized. The craziest thing I saw was a little booth where you can re-use your dog's hair to spin yarn and make clothes. Um. No thanks. The best booth was the Stitch Diva booth. They had just the most young and stylish knit and crochet patterns I have seen in a long time. They are an online based company run by 2 women and they sell all their patterns online at www.stitchdiva.com. What's cool is that you can order patterns online and immediately download them! Gotta love the instant gratification. 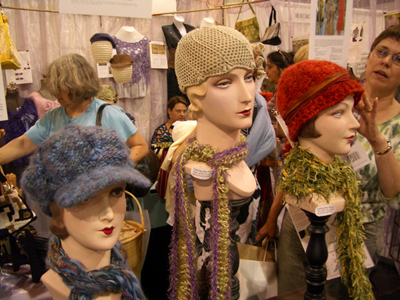 Since I was at the booth, I snatched up 3 patterns so that I could get ready for Fall. I got the "Crochet Flower Pattern Collection", "Decidedly Different Scarves" (I like the Brugmansia Scarf. You can't tell in the photo but it's actually like a outer hollow scarf with this gold inner scarf inside. Just brilliant. ), and finally I got the "Knit Hats Girly Couture" Collection. The new crochet hat pattern which contains the orange ribbon hat and the 20's style beige hat pictured above will be available in a week according to the ladies of Stitch Diva. Check out all their patterns, I know you'll love them. I got my first taste of technology luxury when I went to the Chanel store on Maiden Lane here in SF back in March and purchased a tiny silver cellphone trinket strap. It cost me $170 but at the time it was worth it for the mere idea that I could own something Chanel besides a lipstick. 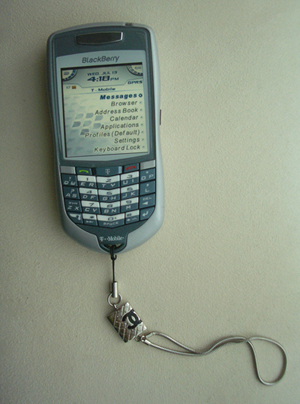 The silver strap is attached with a black string that you can attach to the phone. It has a square pendant that bears the famous CC logo. The strap itself almost works just like a bracelet. Since I’m a woman and don’t put my phone in my pocket, it worked well when I needed to walk around with my phone so I didn’t just drop it on the floor. Cellphone trinkets are slowly coming into the US market. It is pretty HOT in Japan right now where any Tokyo girl could have about 3-4 things hanging and dangling off her phone. But if you aren’t into Hello Kitty or any of those cutesy characters, there is a more affordable alternative. As I started to use my phone more with the attached Chanel strap, I realized that this was something I could totally make myself. 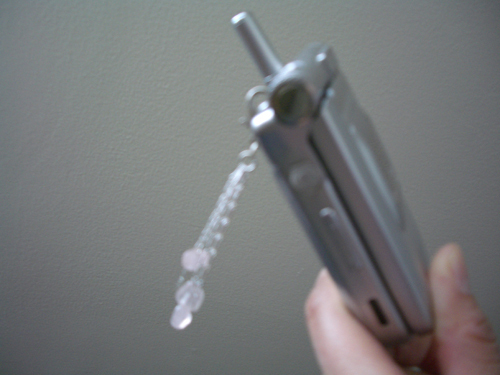 Women make jewelry all the time, why not cellphone jewelry? I headed down to Beyond Beads, a complete DIY bead shop on Howard Street in search of a mission to make a few prototype trinkets, which I will show you how to make yourself today. 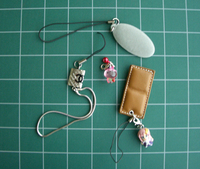 I used my existing strap and the Japanese trinkets I had as a guide as to what kind of materials I would need. I’ve never made jewelry before and I figured it couldn’t be so hard for something small. It’s just a few chains, claps, beads, and the usual deal. I took complete stock of the store, which had everything in fashion according to the last few spring and summer issues of Vogue magazine that I have read. Lots of wood, turquoise, and just beautiful colors surrounded me. I grabbed the little tray to put my beads in and proceeded to walk carefully around the store so that I wouldn’t bump into anyone with a tray or knock into any of the displays containing “hanks” (not tom, rather, hanks are a cluster of beads on a long string). I decided to start with getting some silver chains. To my surprise, they were not expensive at all. The average was about $1.50 - $2.50 per feet. I was designing by eye here so I just took about 3 chains I thought would look cute. I perused all over and found small enough beads that would look good as trinkets and not be bulky or heavy. I got the necessary clasps, clamps, hooks that I needed. And let me say, there are sooooo many teeny tiny little things that are there. It was confusing, but finally I succumbed to asking the lady behind the counter. I didn’t know what to call the little silver chain holders so I had to show the lady my strap. “Oh, you need clamps!” she exclaimed. Clamps! Riiigght. Now I could get started. Cutting pad to work on (protects the table and also keeps the tiny things from slipping. 30 min (give or take) per cellphone accessory depending on how complex you want your design to be. Takes only 5-10 min for existing earring. You can see the sequence of step by step photos up on my flickr photo set. How many times have you lost one earring, only to have a bunch of orphan earrings in your jewelry box? 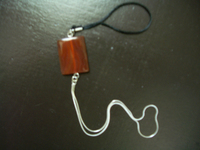 Instead of throwing them away, you can recycle them into other things, like a trinket for your phone. If the look of the earring itself doesn’t look right for your phone, you can go a little further and just extract all the beads. In my example earring, I used a Kris Nations earring, a hip jewelry line run by my good friends, Kris and Kim. Since the look of the earring fit the cellphone look I wanted to achieve, it was easy to make this work. 2)	Place all the contents of the earring in a circular ring. 3)	Then attach the ring to the metal hook. One tip: Make sure when you purchase the little hooks that they are the right fit for your phone. I though the brown stone worked well with the season’s bohemian look of browns and wood, allusions to that Boho style of Kate Moss and Sienna Miller. I could and probably should have gotten a gold tone for the strap, but I wear more silver in the summer. I wanted something minimal, yet bold so I kept it to one dramatic large stone. 1)	Start with the stone and insert 2 small circular clamps in the existing hole of the large stone. The ones I got fit in nice and tight but you can also add a little bit of glue to the clamps before you insert it in. 2)	Then add 1 circular ring to each end while looping in the larger clamps. 3)	Here’s where a steady hand comes to play. On one end, measure out the silver chain and make sure that when it is “folded” that the actual loop size created is what you want to fit around your wrist. If it isn’t, adjust it with a cut as necessary. 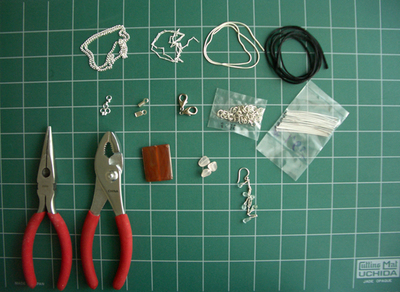 With the chain folded in half, lay the two ends of the silver chain to rest inside the clamp. Take your pliers while carefully holding it all together and clamp down on one side and then the other. If its easier, you can do this step before you insert it into the circular ring attached to the bead. 4)	Next take the piece of black satin string and cut it to size. This string should be significantly smaller than the length of your chain. Do the same clamping as you did for step 3, only you can extend out the ends of the string past the clamp. After you have clamped down on the string, tie a knot at the other end and trim the excess. (You can also add a bit of glue here if you want.) The string is just a way for you to attach the strap to the phone. You could even also try using those black elastic rubber bands for ponytails for this. 5) Your strap is done! To put it on your phone, loop in the black string through the hole on the cellphone and then loop through the contents of the strap through the string. Ok so you don’t like bracelets, a more delicate approach for smaller phones is doing a little dangling trinket. I chose some rose quartz that have a nice soft pink and work well with the silver. I thought I could design something stylish with some tiered layers of stones on the chain with some strands of chains in between. 1)	First, for each of the 3 beads, insert a silver straight pin through the hole. The pins head should flush to the bottom of the bead. 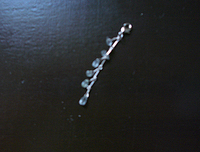 2)	Cut off the excess straight pin for each of the 3 beads, about an inch from the top of the bead. 3)	Using your pliers, bend the pin toward the bead till you form a little loop. 4)	Now take the silver chain and cut 3 cascading lengths. Since this chain actually has a chain-link pattern, it’s easy to see the break off and cut off the pieces. 5)	With the left over chain, cut them to varying lengths as well to make it a nice layered piece. 6)	Now take 1 circular ring, and start by attaching the longest chain with one bead. 7)	Alternate this with a single chain. 8)	Next go with the mid-length chain and bead and repeat steps 6 and 7 till you have finished all the chains. 9)	Now attach the circular ring to a large metal clasp and clamp the ring tight with your pliers. It really is THIS easy. You can follow the steps above as a base model and add to them to make your own creations. Make a few to match your outfits or make it a dazzling one with bling for a night on the town. It can also be a great gift that you can make for your friends. So many of us are in the mood these days for a phone that not only can fit sleekly into a handbag, but can also perform much more than just regular phone duty. Upon the launch of this blog, my close girlfriend from college, Maggie an architect in NY, posed that very question to me. “Which phone should I get the Blackberry or the Treo?” Of course before I could ask her the necessary questions like “What’s your day like? What kind of applications do you need? Calendar, email, instant message or camera?” I had already figured out that for Maggie’s busy work/life style that the Treo made sense. She could take pictures for site visits. She could email and look up her calendar. She could basically do her work when she’s away from her desk. 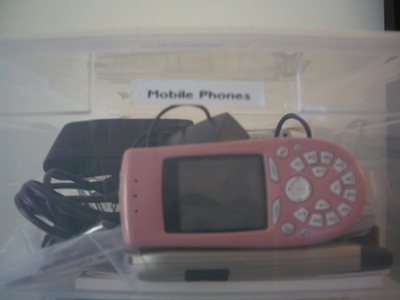 And before I could talk to her, she had already purchased one the next day (She got a Treo 600). 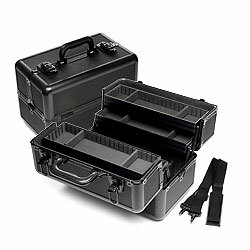 She told me that she needed the organizer, timesheet, outlook sync, etc. Sure there is power in the Treo, but Maggie is also finding she needs to get used to the bigger size. 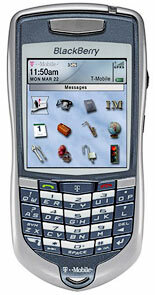 So as Maggie architects her way around NY with her Treo 600, I am still in love with my Blackberry 7100t. I have about 4 other cell phones/pdas that I usually rotate around with but I really haven’t since I got the Blackberry in March. It works for everything. First off, it is so lightweight, that it can fit in any of my handbags – from my small black Gucci handbag that I take out for quick day errands or for a night on the town, as well as in my handy large red Kate Spade leather tote bag. For me it’s all about the email, instant messenger, and quick web access. You can add up to 10 email accounts to the blackberry phone and it’s easy to do with their web site. I even like the “sure type” keys, even though it doesn’t have the full keyboard set like the Treo, I mean, I ain’t writing a novel on this thing! It has actually been pretty good at figuring out what I am writing and finishing my words for me. The Instant Messenger interface is great and customized to AIM, Yahoo and ICQ. I also like the web access. Its really fast and I usually find myself just logging on to My Yahoo! to see what movies are playing and at what time. That’s all I really need it for. I do miss not having a camera attached to the phone but these days I carry around a small Pentax camera that my boyfriend bought in Japan last year. It’s super light as well and takes great hi-res images. If staying connected without all the bulk is important to you, as well as having something that is stylish and cute, go down to your local T-Mobile store to check out the Blackberry 7100t. 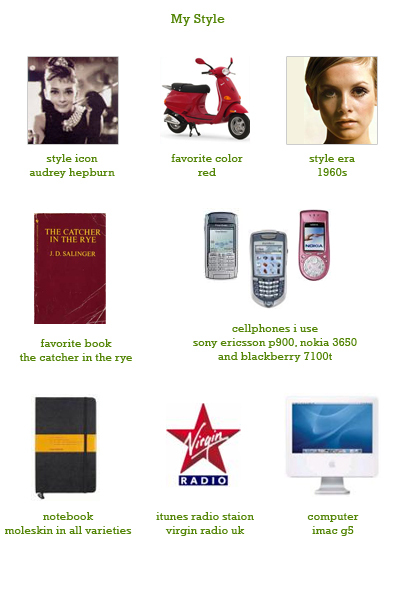 (It’s also way cheaper than the Treo. I got mine for about $200.) For those of you not down with PDA, I’ll be posting soon my thoughts on some other great phones. I’ve since added a Chanel phone strap/bracelet as an accessory! The best $20 gadget EVER! Remember back in the day when you were a kid and you played with your dad’s plastic label maker? It had a huge rotary dial that made fun clicking noises and you had to literally punch with all your might (probably with both hands) in order to make letter impressions on plastic tape. Oh yes THAT plastic tape…you know, the one typically got stuck and you basically ended up punching letters over on top of each other till it came out in one big punched up mess. Well it turns out label makers have finally entered the digital age. OK, they have been around for a while but now its not just for those Connecticut housewives anymore. You know, those $250 fancy ones that Martha Stewart used to tout 10 years ago. (Yes, I secretly longed for one when I saw it on her show.) It turns out the makers of those old school label makers, Dymo, have come out with one that is completely affordable and might I add, WONDERFUL. 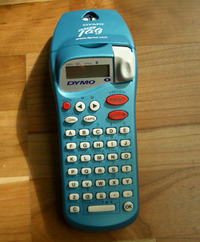 Ever since I bought the Dymo LetraTag Label Maker at Target (about $21.89) a few months ago, I have gone label happy. You can never make a mistake! You can type everything out, go back, change font and style, even add cute little symbols! It comes with white sticker tape, but I also bought an extra clear plastic one too. Plus, it is so easy to be able to interchange the tape cartridge. You just literally take it out and pop the other one in at any time. You don’t have to wait till you finish one roll. I checked the dymo site and they even have iron on tape (for clothes) as well as metallic colors! Oooh!! It’s expensive off the Dymo site so I’ve actually found it cheaper on Amazon for you. Listen, just think how great it will be to open up your file drawer and have everything legible. 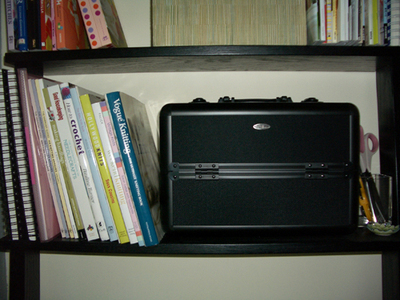 Not only that, you can be creative and stick labels in drawers, on bookshelves, on notebooks, or even personalize your iPod. I promise you this will be your most useful gadget! 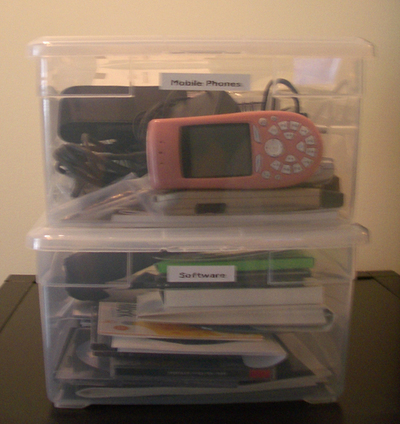 For years now my friends and colleagues have regarded me as the gadget/technology girl. For the most part, I love it but that is not my complete personality. Technology, for now, lives in a man’s world. Most gadget and technology magazines are rolled into men’s style magazines or end up having bikini-clad women on the cover. What's a style fashionista to do? 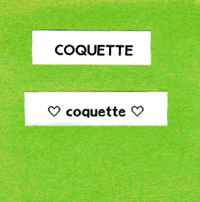 I am creating this blog “Coquette” (a french term meaning “stylish woman”) in order to answer my own desire to create ONE place that doesn’t have to separate technology from a woman’s style and interests. 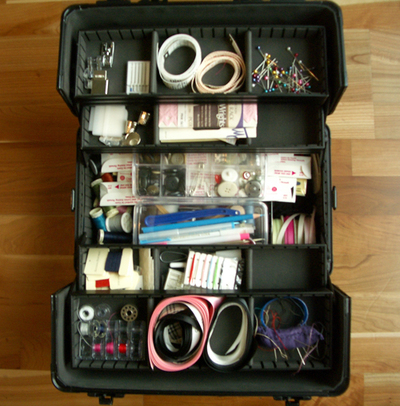 Interests, which can include fashion, crafts (knitting, needlepoint, embroidery), home décor, graphic design, and more. Look ladies, we are moving into a digital age and I know there is so much more exciting things out there than what is being presented to us. I will do my best to present cool ideas, DIY, crafts, gadgets, and cellphones without all the hype -- but with style so you too can be “Coquette”. There will be lots more to come. For now, here's a glimpse of me.